Has your ACE lock broken or have you replaced it? I think we need a thread dedicated to ACE locks, as they don't all have the same lock as the Vegas/AXIS. A number of people have stated they had their ACE locks break, so I think we need to identify which ACE locks are breaking. I called Trimark today to attempt to preemptively replace my lock with a steel plunger model and I was told they don't make one. She stated that the lock on my ACE does not have a steel plunger equivalent (only Zinc) and further, that this lock has not had a breaking problem. She was familiar with the lock with issues, but said mine was not it and didn't have problems. While I gave her the model number, she first identified it by color, with white on the inside and black on the outside. That combo of white inside/black outside let her know what model it was. Has anyone had this style lock break? If you have had a different ACE lock break, can you post a picture of it, so those with ACE's will know which locks are the high failure locks? I have a 2017 29.3 and have not had any problem with the lock or locking system. Yes I have had to tighten the screws a couple times but other than that I have not had a failer. What type of failer are you referring to? Correct. From what I can tell, some ACE's have locks like the bottom image in my first post and some like the top image. For ACE owners who have had failures, I'm trying to determine if it's limited to the lock in the bottom image (black on both sides, horizontal orientation), or if both styles are failing. Trimark claims the problem is only with the bottom style. 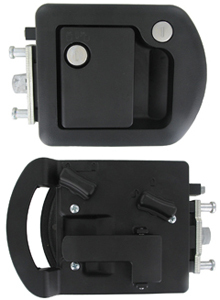 In addition, I don't see a Bauer/RVlock replacement that looks like it will replace the lock in that top image. Our ACE is 14 months off the original selling dealer's lot and just over 5000 miles. No lock problems so far. Our lock looks like the bottom picture except the locking levers are RED. I always thought it was the same lock as the Axis/Vega had. The one in our Axis is identical to that (same as the bottom one with the locking handles in red). So far no issues with our lock, but I've been very careful about opening/closing it since reading that thread (and a few others also detailing the issue). Our Vegas 25.2 has the lock in the top photo. We do have a problem with it being hard to open the door sometimes. We pull the handle up and hear the click, but we have to slam into the door to open it. Not always, but most of the time. Our ACE 30.1 had the bottom lock type. We replaced it with a Bauer electronic lock shortly after we got the coach as I didn’t want to have to deal with keys except in an emergency. I looked at RVLock, but you will find a number of posts where people found they had to modify their screen doors, which is somewhere I didn’t want to go. The RVLock does give you a lot more combinations. We had a Bauer on our previous travel trailer and it worked fine. The Bauer for the ACE fit well, but I ended up using the original door frame strike plate as the coach appears to have been build around it. The Bauer front plate is a bit smaller than the OEM so the decals don’t go to the edge any more. The one problem I’ve had is that the Bauer seems to want to reset itself back to the default codes. It’s happened several times. I’m guessing that while driving the batteries lose contact momentarily which causes the reset. Only takes a moment to reprogram back to our normal code. I used lithium batteries instead of Alkaline and there could be a small dimension difference or the battery springs aren’t strong enough. I had the same problem on my 2017 25.2 Adjusting the latch position in the frame solved it for awhile but it happened again after a week of use. Adjusted again as well as adding Lock-Tite to the screws holding the latch. No further problems, opens and closes easily. Also have gotten into the habit of never just slamming the door. We always open the latch, close the door then give it a nudge to close it completely. During my PDI last week we had this problem. One of the tech's made it worse with his adjustment (he was a JR). The senior tech and salesman both knew what needed to be done, which was loosen the Bolt (or whatever you call the round thing coming out of the frame, and slide it back a bit towards the coach and then retighten. They said if it's too far out, that it gets deep into the latch mechanism and jams a bit. We were having to hit the door with our shoulder to go out. Now, it opens with no effort at all. They did warn that if you loosen that round bolt too much that the nut behind it in the frame will drop come loose and drop to the bottom of the frame, so you want to loosen it only enough to allow it to slide a bit, and then retighten. Also, after he tightened it with a large allen key, the then grabbed a long handled pipe wrench to further snug it so it didn't work it's way loose. If you have the bottom pictured lock CHANGE IT NOW. Ours broke 600 miles from home on what was to be a nice two day trip home. My wife and two dogs and I were inside and then had to make it home that day. Wife and I were OK with staying inside the ACE but I had to crawl out to get gas one time. The problem was our dogs that couldn't stay in for two days so we had to make it home. At home I got tools to tear out the lock and finally got everyone out about midnight. There should be a recall on this lock but so far there is not to my knowledge. I replaced with a Bauer because I refuse to buy another lock from the same company that built that failure prone garbage. The Bauer keypad sometimes gets picky about putting in the code but always works with the key. 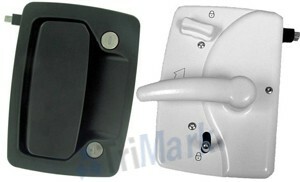 It is also a different design of the latch and does not appear to have a weak spot. Jim. Does it look like the top or bottom picture in the first post of this thread? yesterday I had my ace 30.1 at the dealer for service and they could not get in. The service rep at the dealer had a worker crawl in and take apart the latch and found the throw was broken in half. Same latch as yours. It was this style latch? Water pressure at 100 PSI?? ?